During my last trip to India i came across this piece of news, and i just could not ignore it. 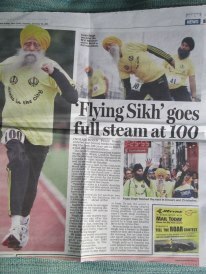 a 100 years old man shared in a big marathon and ran for 8 hours non-stop! really we human-beings can do anything once we get in touch with our true self! The man was asked about his secret, and his answer was "being happy". Just by being happy, he did what some youth can not do nowadays. Be happy today! and believe in your abilities, then watch yourself doing the impossible. The story of this man is one example of many, if only we look around us, there are a lot of examples and proofs that we can expand, and go beyond what physical science can explain. Once we stop blaming our mistakes, and failures on destiny; Once we acknowledge our responsibility about all the good / bad things we manifest in our life, we all can be this man. because age does not matter, getting old does not matter. We make a big deal out of aging that it is now rooted in our mindset that we become weaker as we get older. How about an exerciser for today? If you worry too much about getting old, why don't you work on your current beliefs and change them to something like "I am perfect health no matter how old i am". type it down, look at it all the time until your subconscious is programed to this fact. Thank You!